Anxiety, suffering and death are not simply the "ills" of our society, nor are they uniquely the product of a sick and sinful humanity. We must all some day confront them, and we continually face their implications long before we do. In that sense, the Garden of Gethsemane is not merely a garden "outside the walls" of Jerusalem but also the essential horizon for all of us, whether we are believers or not. Emmanuel Falque explores, with no small measure of doubt, Heidegger's famous statement that by virtue of Christianity's claims of salvation and the afterlife, its believers cannot authentically experience anxiety in the face of death. 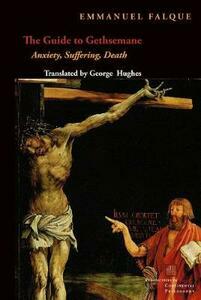 In this theological development of the Passion, already widely debated upon its publication in French, Falque places a radical emphasis on the physicality and corporeality of Christ's suffering and death, marking the continuities between Christ's Passion and our own orientation to the mortality of our bodies. Beginning with an elaborate reading of the divine and human bodies whose suffering is masterfully depicted in the Isenheim Altarpiece, and written in the wake of the death of a close friend, Falques's study is both theologically rigorous and marked by deeply human concerns. Falque is at unusual pains to elaborate the question of death in terms not merely of faith, but of a "credible Christianity" that remains meaningful to non-Christians, holding, with Maurice Blondel, that "the important thing is not to address believers but to say something which counts in the eyes of unbelievers." His account is therefore as much a work of philosophy as of theology-and of philosophy explicated not through abstractions but through familiar and ordinary experience. Theology's task, for Falque, is to understand that human problems of the meaning of existence apply even to Christ, at least insofar as he lives in and shares our finitude. In Falque's remarkable account, Christ takes upon himself the burden of suffering finitude, so that he can undertake a passage through it, or a transformation of it. This book, a key text from one the most remarkable of a younger generation of philosophers and theologians, will be widely read and debated by all who hold that theology and philosophy has the most to offer when it eschews easy answers and takes seriously our most anguishing human experiences.